Curtis McLaughlin, D.B.A., John Fryer, Ph.D., Douglas R. Smucker, M.D., M.P.H. Primary Care Providers at a Group Model HMO. After six months, functional recoveries, return to work and complete back pain recoveries were similar for all groups. Satisfaction with care was highest for those visiting DCs. BACKGROUND: Patients with back pain receive quite different care from different types of health care practitioners. We performed a prospective observational study to determine whether the outcomes of and charges for care differ among primary care practitioners, chiropractors, and orthopedic surgeons. METHODS: Two hundred eight practitioners in North Carolina were randomly selected from six strata: urban primary care physicians (n = 39), rural primary care physicians (n = 48), urban chiropractors (n = 32), rural chiropractors (n = 32), orthopedic surgeons (n = 29), and primary care providers at a group-model health maintenance organization (HMO) (n = 28). 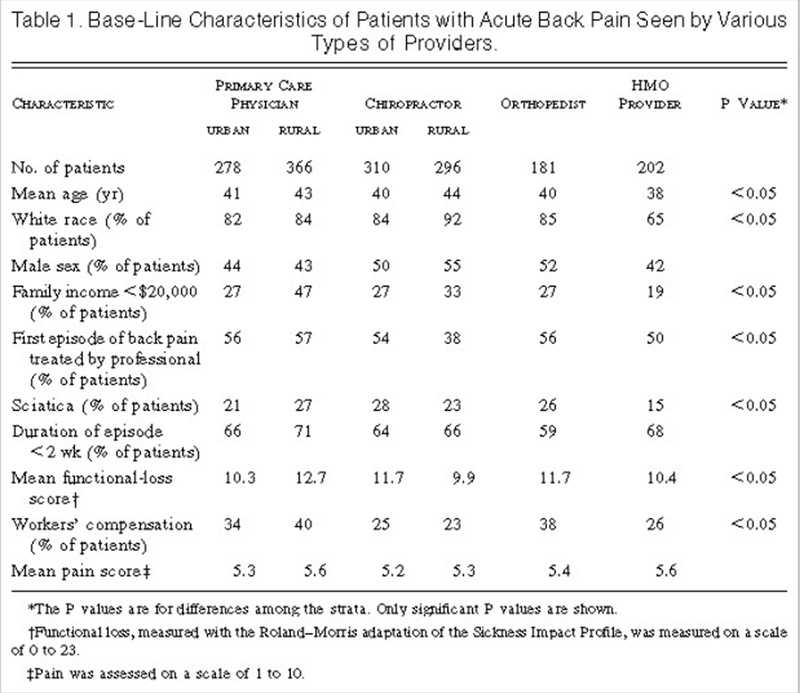 The practitioners enrolled consecutive patients with acute low back pain. The patients were contacted by telephone periodically for up to 24 weeks to assess functional status, work status, use of health care services, and satisfaction with the care received. RESULTS: The status at six months was ascertained for 1555 of the 1633 patients enrolled in the study (95 percent). The times to functional recovery, return to work, and complete recovery from low back pain were similar among patients seen by all six groups of practitioners, but there were marked differences in the use of health care services. The mean total estimated outpatient charges were highest for the patients seen by orthopedic surgeons and chiropractors and were lowest for the patients seen by HMO and primary care providers. Satisfaction was greatest among the patients who went to the chiropractors. CONCLUSION: Among patients with acute low back pain, the outcomes are similar whether they receive care from primary care practitioners, chiropractors, or orthopedic surgeons. Primary care practitioners provide the least expensive care for acute low back pain. We performed a study to determine the outcomes among patients with acute low back pain seeking care from a variety of practitioners. Specifically, we wanted to determine whether outcomes and charges vary according to the type of provider initially seen for an episode of acute low back pain. and a small number of nurse practitioners and physician's assistants at a group-model health maintenance organization (HMO). We defined primary care as family practice, general internal medicine, or general practice. Very few osteopathic physicians practice in North Carolina. We did not include physical therapists as primary care givers for patients with acute back pain, since such patients rarely seek care from a physical therapist first. None of the neurologic surgeons who were selected saw a substantial number of patients with acute low back pain. Since few orthopedic surgeons practice in rural areas, we did not divide this group into rural and urban practitioners. 28 physicians and nurse practitioners or physician's assistants in a group-model HMO. The practitioners invited consecutive patients with acute low back pain to participate in our study. The criteria for enrollment included back pain of less than 10 weeks' duration, no previous care received for the pain, no history of back surgery or cancer, and no pregnancy at the time of the initial visit. In addition, the patient had to have a telephone and speak English. The practitioners obtained consent from the patients and recorded basic information from the history and physical examination at the initial office visit. Staff members of the University of North Carolina Survey Research Unit performed all interviews. The study was observational, and we made no attempt to influence the practitioners' decisions about diagnostic tests or treatments. Staff members in each practice kept a list of patients recruited for the study, allowing an assessment of approximate recruitment rates. Fifty percent of patients with back pain seen by the practitioners were eligible for the study, and only 8 percent of those who were eligible declined enrollment. The main reasons for ineligibility were chronic pain and previous treatment for the current episode of pain. Patients were paid $20 for the time they spent answering interview questions. They were told that the purpose of the study was to determine how long back pain usually lasts and the types of treatments used. Members of the Survey Research Unit contacted the patients by telephone shortly after the index office visit. The median time from the index visit to the base-line telephone interview was seven days. The primary outcome was the date of return to a functional status equivalent to that before the onset of pain. At each interview, patients were asked whether they had returned to their previous functional status. In addition to that question, we asked patients whether they had completely recovered from their back pain (i.e., whether they were “completely better”). We measured the functional status at each interview with the Roland–Morris adaptation of the Sickness Impact Profile, a 23-item validated scale that specifically assesses loss of function due to back problems. [9, 10] We also assessed the patient's work status at each interview. Satisfaction with care, determined with the use of a questionnaire designed for a previous study of back pain,  was assessed at the interview during which the patient reported complete recovery or at 24 weeks, if the patient had not previously reported complete recovery. Telephone surveys were used to record all the care received from all providers. Detailed information about the care received from the index provider was obtained from patient records, and this information correlated well with that reported by the patients. Data on the charges for outpatient services were based on average statewide charges assigned by a large health insurance carrier. The charges were specific for the specialty. For example, lower charges were assigned to lumbar radiographs obtained by chiropractors than to those obtained by medical doctors. Charges for medication were calculated as the average wholesale cost to the pharmacist plus 40 percent. We assumed a two-week course of medication at each interval in which the patient took medication. The categories of care for which charges were assigned included office visits, radiography and other imaging studies, medication, physical therapy, and other modes of treatment. Charges by chiropractors largely represent the last category. Additional information on assigned charges is available on request. To compare charges in the HMO stratum with those in the other strata, we assigned charges to units of care provided by the HMO practitioners, using the same decision rules that we used for the other strata. and the rank order of charges. From June 1992 to March 1993, a total of 1633 patients were enrolled in the study. The clinical and demographic characteristics of the patients in the six strata were generally similar, although there were statistically significant differences for a number of variables (Table 1). The patients were relatively young, and a substantial minority had sciatica. Workers' compensation was involved in 31 percent of the cases. In each stratum, 59 percent or more of the patients had acute back pain of less than two weeks' duration. 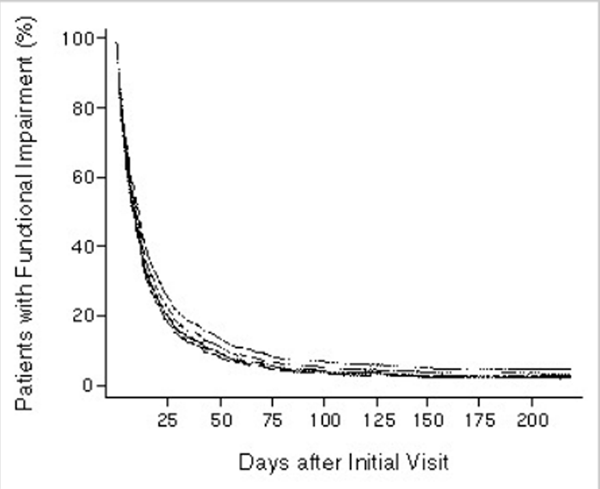 Overall, patients had rapid improvement, with a median of 8 days and a mean of 16 days to functional recovery (a return to a functional status similar to that before the onset of low back pain). Only 5 percent of the cohort had not reported functional recovery by the end of the six-month study period. Functional recovery, estimated to the nearest day by the patient, corresponded to an improvement in the disability score on the Roland–Morris scale (from 11 to 4.1). The strongest predictor of a delay in the return to normal functioning was a high level of functional impairment at base line. A nonparametric Kaplan–Meier analysis revealed no clinically significant differences in the time to functional recovery among the six strata. A Cox proportional-hazards model adjusted for the duration of pain before the initial visit, the presence or absence of sciatica, functional status at the base-line interview, family income, status with respect to workers' compensation, and educational level confirmed this finding (Figure 1). Restricting the analysis to patients who were seeking care for back pain for the first time did not change the findings. The power to detect a 10 percent difference in the rate of functional recovery at two and four weeks was greater than 95 percent. Treated by Various Types of Providers. The confidence intervals overlap (data not shown), with no statistically significant differences among the six strata. Data have been adjusted for base-line differences in functional status (the Roland–Morris score), the presence or absence of sciatica, income, duration of pain before the index visit, workers' compensation status, and educational level. Because of overlap, not all of the six curves are visible. We also asked patients at each interview whether they were “completely better.” For each interval between interviews, we calculated the proportion of patients who had reported complete recovery. Logistic regression was used to determine the effect of the type of provider on the probability of complete recovery at each interval, with an adjustment for clinical and demographic covariates. Thirty-one percent of the patients did not consider themselves completely better at the end of six months. Differences in the probability of recovery according to the type of provider were of borderline significance at base line and 2 weeks and not significant at 4, 8, 12, and 24 weeks. After adjustment for base-line variables, there were no significant differences among the six strata in the estimated mean disability scores on the Roland–Morris scale. Patients who reported functional impairment continued to have high disability scores. In the three-month period before the index office visit, 84 percent of the patients were employed. At the time of the base-line interview, the mean number of days of work missed in the previous month because of back pain was 2.9. Over 95 percent of the patients were back at work by the four-week interview, with no differences among the strata. We used patients' reports and records to estimate the number of visits to providers. If a patient initially saw an urban primary care physician and had two subsequent visits with that physician, plus one visit to a physical therapist and two visits to an orthopedic surgeon, the total number of visits assigned to the primary care physician was six. The data presented are unadjusted; adjustment for the base-line variables did not substantially affect the results. The mean number of visits differed substantially among the strata (Table 2), ranging from 3.1 in the HMO stratum to 4.4 and 5.5 in the primary care and orthopedic strata, respectively. 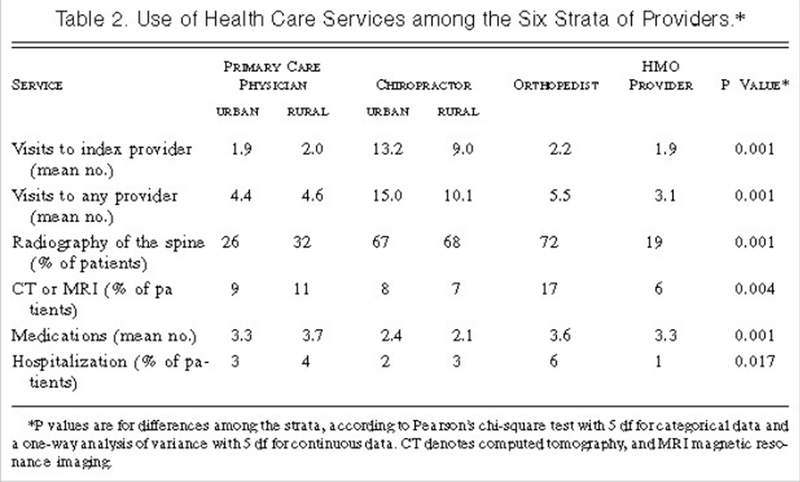 The mean number of visits among the patients seeing chiropractors was 10.1 in the rural stratum and 15.0 in the urban stratum. Although the most common treatment used by chiropractors was spinal manipulation, additional treatments included heat, cold, diathermy, ultrasonography, electrical stimulation, and traction. The average number of prescription or over-the-counter medications used was higher among the patients seen by primary care physicians, orthopedists, or HMO providers than among the patients seen by chiropractors (3.5 vs. 2.3 medications, P<0.001). The number of medications was similar among the primary care, orthopedic, and HMO strata. The patients who saw chiropractors took an average of 0.7 prescription medication during the episode of back pain, as compared with 1.9 prescription medications taken by the patients who saw primary care, orthopedic, or HMO providers. The most common medications were acetaminophen, over-the-counter nonsteroidal anti-inflammatory agents, prescription nonsteroidal anti-inflammatory agents, muscle relaxants, and narcotic agents. Plain spine radiographs were used more frequently by the chiropractors and orthopedists (in 67 to 72 percent of the patients) than by the other groups of providers. There were no statistically significant differences in the use of radiographs among the three primary care strata. Computed tomography and magnetic resonance imaging, which were used in all strata, were used most frequently in the orthopedic stratum and least frequently in the HMO stratum. Hospitalization rates were low in all six strata. The overall rate was 3.5 percent. Only one patient in the HMO stratum was hospitalized. We estimated the charges for outpatient care in each of the six strata (Table 3). Both unadjusted and adjusted data are presented. Because of the low number of hospitalizations, we focused on outpatient charges. Chiropractors and orthopedists had the highest charges. The chiropractors' charges were high because of the use of radiographs and the large number of office visits, which more than made up for the low charge per visit. The orthopedists' charges were high because of the high charge per visit, use of diagnostic procedures, and use of physical therapy. The distribution of charges per episode of back pain was highly skewed, with a small proportion of patients (6 percent) who had outpatient charges exceeding $2,000. The median charge per episode, which is less subject to the effect of these outliers than the mean charge, shows the same pattern, with higher median charges in the strata of orthopedists and chiropractors (Table 3). Charges in the three primary care strata were very similar. The HMO stratum had fewer outliers than the other strata (3 percent of the HMO patients had charges exceeding $2,000). Log transformation and nonparametric tests yielded a similar pattern. During the interview at which the patient reported complete recovery or at the six-month interview, for those who did not report complete recovery, the patients were asked about their overall satisfaction with the care they had received. Patients who saw chiropractors reported a significantly higher degree of satisfaction than those who saw practitioners in the other four strata (Table 4). A logistic-regression analysis showed that the patients who saw orthopedic surgeons were somewhat more satisfied than the patients who saw primary care providers but were less satisfied than those who saw chiropractors. The higher level of satisfaction among the patients who saw chiropractors persisted after adjustment for the number of visits and the use of radiography. The strongest correlates of satisfaction were the patient's responses to questions about the quality of the provider's history taking, examination, and explanation of the problem during the visit (Table 4). In this study of acute low back pain, only 5 percent of the patients had not reported functional recovery at six months. However, 31 percent of the patients had not completely recovered at six months, which indicates that low-grade disability may last longer than previously thought. A study conducted at an HMO yielded similar results. Whether the patient saw a primary care physician, a chiropractor, or an orthopedic surgeon as the initial provider, the time to recovery from the acute back pain was essentially the same. Primary care physicians appear to offer efficient outpatient treatment, with some evidence that the most efficient care may be provided in a group-model HMO. Although charges per radiograph and per visit are lower for chiropractors than for medical doctors, the much higher number of treatments given by the chiropractors (requiring a larger number of visits) more than offsets this apparent advantage. For acute low back pain, the best care may be minimal care. Our finding that the higher charges by chiropractors reflected a larger number of visits per episode of back pain is similar to the result of a secondary analysis of data from the Rand Health Insurance Experiment, performed by Shekelle et al. They reported a mean of 10.4 visits to chiropractors per episode, as compared with 2.3 visits to primary care physicians. Our study was observational; patients were not randomly assigned to the various types of providers. A randomized trial would be very difficult to perform in a community setting. Since the patients in our study were enrolled at the time of the initial office visit, we could not assess their functional status before the episode of back pain. The outcomes of care provided by practitioners who rarely serve as first-contact providers (e.g., physical therapists and rheumatologists) could not be assessed. In addition, our analysis of charges relies on estimates, but the differences among the strata of providers were substantial. Several studies have reported improved outcomes among patients undergoing spinal manipulation, as compared with those receiving medical treatments. [20-24] Our study did not confirm these results. Several explanations are possible. There may have been a benefit from spinal manipulation, but uncontrolled confounding due to unmeasured differences in the case mix may have obscured this effect. The differences among the strata in our study were actually smaller after adjustment for the presence of sciatica, the duration of pain, and functional status, indicating that significant differences in recovery rates among the strata would have been unlikely after a further adjustment for case mix. Alternatively, the treatment provided by the randomly selected chiropractors in our study may not have been as effective as the treatment provided in trials in which the intervention was standardized. Do our findings simply reflect the natural history of acute low back pain, with essentially no modification by medical or chiropractic care? Since our study did not include a group of patients who sought no care for their acute back pain, we cannot answer this question. Improved techniques of self-care should be investigated. Acute back pain is sufficiently disabling, however, that many persons will continue to seek professional care. Our finding that the patients in the chiropractic strata were more satisfied with their care than the patients in the other strata is consistent with the results of a previous study by Cherkin and MacCornack. Multiple outcome measures (the time to functional recovery and return to work, the time to complete recovery, and functional status) were similar in the chiropractic and physician strata, yet the patients seen by chiropractors reported greater satisfaction with the examination and explanation of the problem. Patients and insurers need to address the trade-off between the substantially lower charges by primary care practitioners and the higher level of satisfaction with the care that chiropractors and orthopedic surgeons provide. Our study has implications for health care policy. The costs of acute back pain are substantial. Previous studies by our group have shown that 3 percent of the North Carolina population seek care for acute low back pain each year. It is important to compare the effectiveness of short and long courses of spinal manipulation. Since the choice between specialists and doctors of chiropractic as primary providers of care is not associated with a difference in the functional outcome, the marginal costs (i.e., for increased care without an improvement in function) are very high. Although medical researchers should continue to seek more effective therapies for acute back pain, the continued use of marginally effective therapies and expensive, low-yield diagnostic tests has led to a level of health care utilization that probably cannot be sustained in an era of increasingly limited resources. Supported by a grant (HS06664) from the Agency for Health Care Policy and Research. We are indebted to Richard Deyo, M.D., M.P.H., and the Seattle Back Pain Outcomes Assessment Team for the use of their questionnaires and for helpful comments. From the Sheps Center for Health Services Research (T.S.C., A.J.) and the Departments of Medicine (T.S.C., J.G. ), Family Medicine (D.R.S. ), Biostatistics (J.F. ), and Business (C.M. ), University of North Carolina, Chapel Hill. Address reprint requests to Dr. Carey at the Sheps Center for Health Services Research, 725 Airport Rd., 2nd Fl., UNC-CH, CB#7590, Chapel Hill, NC 27599-7590. Investigators participating in the North Carolina Back Pain Project include P. Curtis, J. Darter, G. DeFriese, A. Evans, N. Hadler, G. Hunter, J. Joines, W. Kalsbeek, T. Konrad, R. McNutt, T. Ricketts, and D. Taylor. Deyo RA, Cherkin D, Conrad D, Volinn E.
Cost, controversy, crisis: low back pain and the health of the public. Shekelle PG, Adams AH, Chassin MR, Hurwitz EL, Brook RH. North Carolina's minorities: who and where. In: CHES studies. No. 72. Health, and Natural Resources, 1993. Acute severe low back pain: a population-based study of prevalence and care-seeking. Comparative validity of the Sickness Impact Profile and shorter scales for functional assessment in low-back pain. Cherkin, D.C. and MacCornack, F.A. Use of ranks in one-criterion variance analysis. Practical nonparametric statistics. 2nd ed. New York: John Wiley, 1980. On the variances of asymptotically normal estimators from complex surveys. release 4.0. College Station, Tex. : Stata Corporation, 1995. 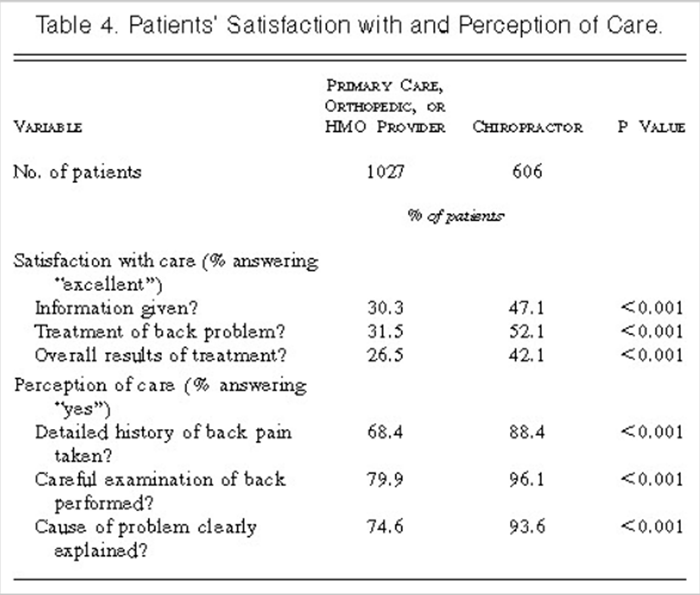 Von Korff M, Deyo RA, Cherkin D, Barlow W.
Back pain in primary care: outcomes at 1 year. 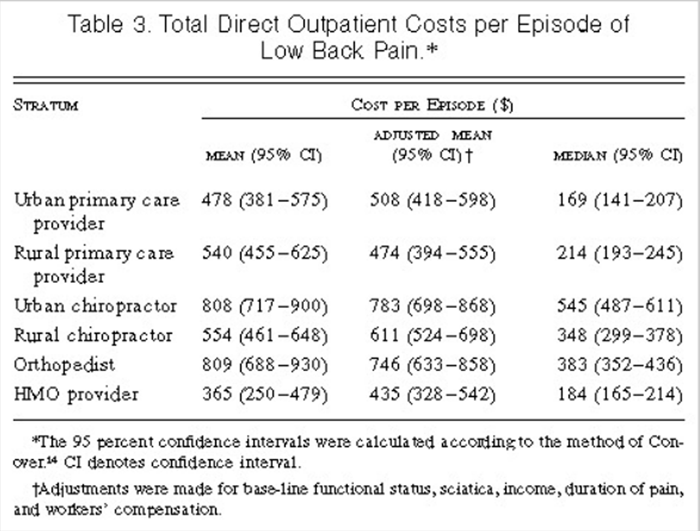 Comparing the costs between provider types of episodes of back pain care. Hadler NM, Curtis P, Gillings DB, Stinnett S.
A benefit of spinal manipulation as adjunctive therapy for acute low-back pain: a stratified controlled trial. Low back pain treated by manipulation. Manipulation in treatment of low back pain: a multicentre study. Godfrey CM, Morgan PP, Schatzker J. A randomized trial of manipulation for low-back pain in a medical setting.